Free time for blogging seems to be becoming more and more elusive at the moment, as you may have noticed I am struggling to post recipes regularly and my weekly emails are, well, not currently weekly! I'm working on some new photography projects, trying to stay on top of my day job, dedicate enough time to my family, and occasionally fit some sleep into the mix! To be honest it is all feeling a bit challenging at the moment! I love working on The Wee Scottish Whisk though so fear not, the recipes will keep coming. Even when it feels like there are not enough hours in the day for everything else we do still need to eat, and this easy salad is perfect for the hot summer weather that has hit Hong Kong. We have suddenly jumped from fresh warm spring days straight into a 35-degree heatwave that is showing no sign of relenting. So this coming weekend the plan is for paddling pools and light BBQ food, that we will likely eat whilst hiding in the air con! Cut the halloumi into slices approximately 1 cm thick. Heat a griddle pan or heavy-based frying pan and fry the halloumi for a couple of minutes until one side turns golden in colour. 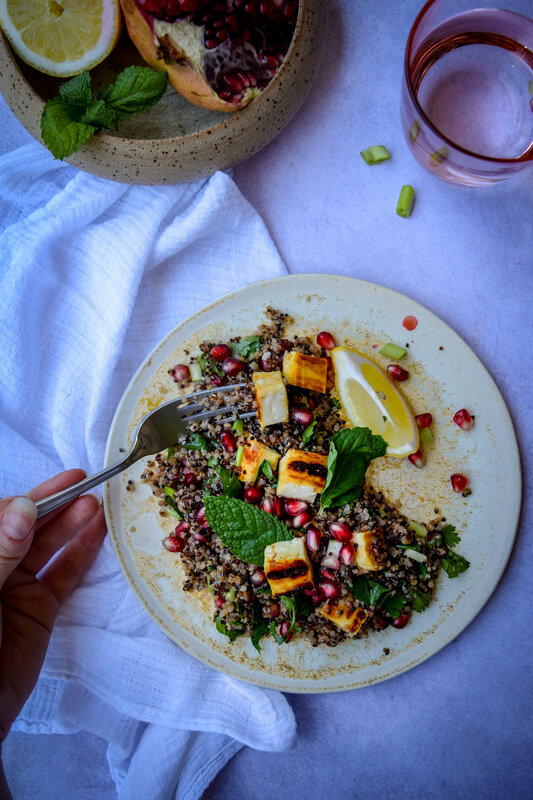 Turn the halloumi and drizzle the lemon juice and honey into the pan, continue to fry until the halloumi is golden brown on both sides and the lemon juice has reduced to glaze the cheese. Watch the pan carefully as it can burn easily after adding the honey. In a large bowl toss together the quinoa, pomegranate, herbs, spring onion, and some seasoning. Mix in the dressing. 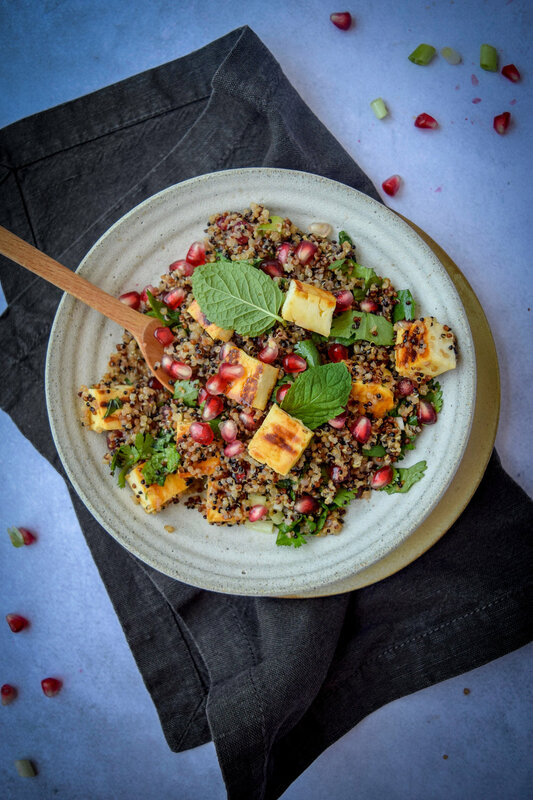 Cut the cooked halloumi slices into smaller cubes and mix through the salad or serve on top. Perfect with some grilled meat or chicken from the BBQ, or delicious on its own for lunch.